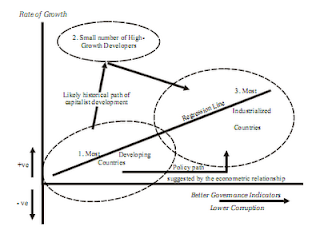 Roving Bandit: What does corruption have to do with development? A commentator suggests that a "tolerable administration of justice" needs to incorporate "zero-tolerance of corruption." I agree about the importance of predictability, but corruption is a pretty broad concept, and is it always the most binding constraint? Mushtaq Khan at SOAS has some great work skewering the cross-country approach to corruption and growth which dominates the literature. This chart in particular articulates that old favourite: Correlation does not necessarily mean causation. You're completely right here, Lee. I'm going to post another lengthy rant about this shortly. I was taught by Mushtaq back when I did my MSc, and he's brilliant, particularly on corruption. I was never taught by him but I went to his inauguration lecture which was great. Generally I feel SOAS is a bit too critical of the 'mainstream' and not quite constructive enough. But Khan is still the best person I've read on corruption.